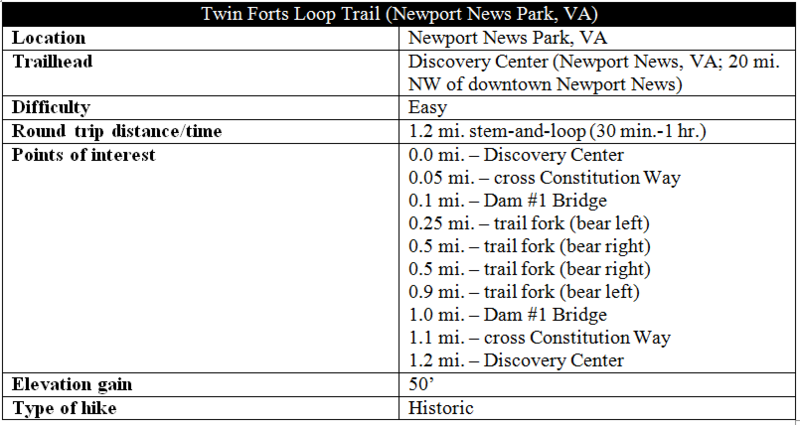 The Twin Forts Loop Trail in Virginia’s Newport News explores the site of the Battle of Dam No. 1, a failed Union attack on a Confederate fortification on April 16, 1862. Part of the three-month Peninsula Campaign, the Union defeat was the second of the month (a similar effort failed at nearby Lee’s Mill on April 5) and reinforced Gen. George McClellan’s reluctance to press forward with an attack on Richmond, the nascent Confederate capital. The battle ended with 165 Union and 90 Confederate casualties, the bloodiest battle of the campaign to date. Now overtaken by hardwood forest, the former battleground lies within present-day Newport News Park and—like much of Confederate Col. John Magruder’s “second line” of fortifications on the peninsula—it is relatively well-preserved. The Twin Forts hike—which clocks in at around 1.2 miles and includes a scenic crossing of Lee Hall Reservoir—includes a series of waysides that covers the narrative of the battle. A white historical marker at the Discovery Center lays out the setting: after an initial Union attack at Big Bethel in June 1861, Confederate Col. John Magruder set about establishing a three-tier system of defenses on the peninsula to thwart a potential Federal march on Richmond. Such a threat arrived in March 1862, when Gen. McClellan’s Army of the Potomac began a slow slog up upcountry from Fort Monroe. By early April, the Union Army had breached Magruder’s weak first line but was thwarted at nearby Lee’s Mill, a Confederate-held chokepoint along the much stronger second front. 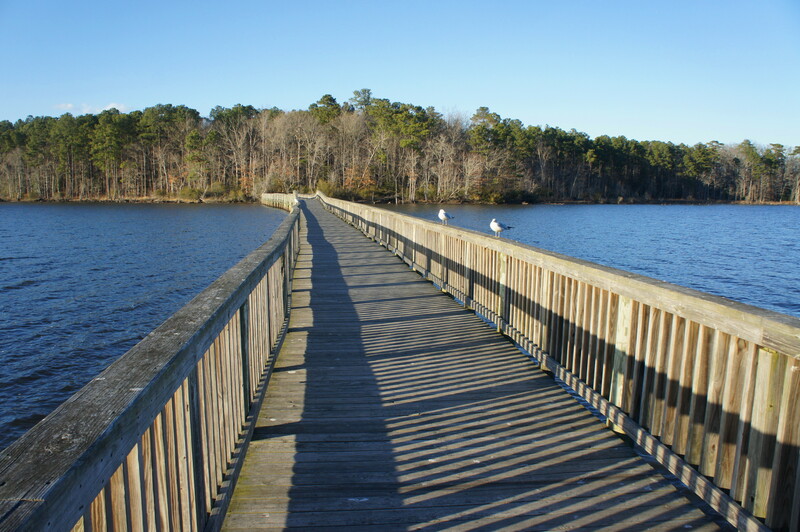 As you cross the lengthy boardwalk, it is worth noting that the terrain here looks different today than it did during the battle. Today’s reservoir is much bigger than the lake created by the Confederates as part of their defenses in 1862. However, the Warwick River proved to be a significant barrier to the Union advance. The attack on April 16 began as a probe—after 11 days of stalling, McClellan sent 18 cannons and a relatively small infantry force under Brig. Gen. William “Baldy” Smith to scope out the Confederate defenses and, if possible, press an attack. Smith did as much, opening with volleys of artillery fire in the morning, following by an infantry attack in the afternoon, when he ordered around 200 troops from the 3rd Vermont Infantry to cross the river and seize the enemy’s rifle pits on the other side. Despite taking fire, the Vermonters succeeded in taking the position from the Confederates…for the moment. 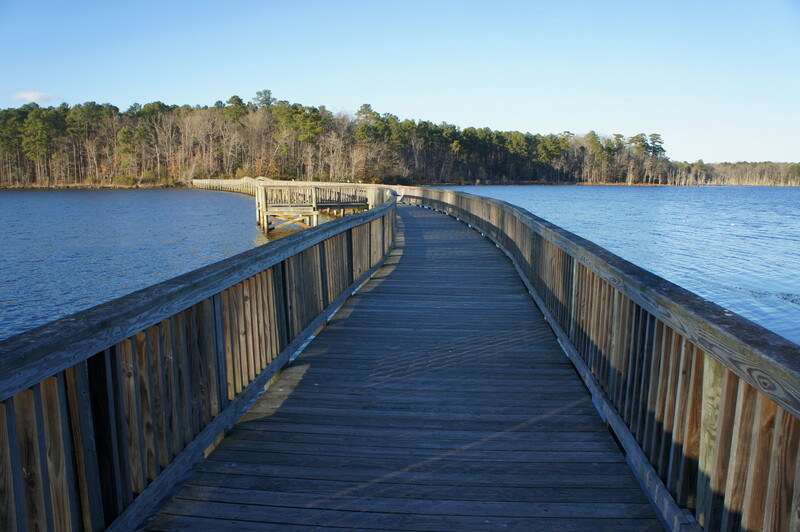 The remnants of the Confederate fortifications come into view as you cross the reservoir and reach a trail junction, the official start of the Twin Forts Loop Trail. Take a left on the dusty path to follow the story in chronological order; the next wayside—titled “One-Gun Battery” and situated close to the position seized by the Vermonters—is up ahead on the left. Past the sign, the trail leaves the shores of the reservoir and bears northwest into the woods. Confederate earthworks are visible on the right. 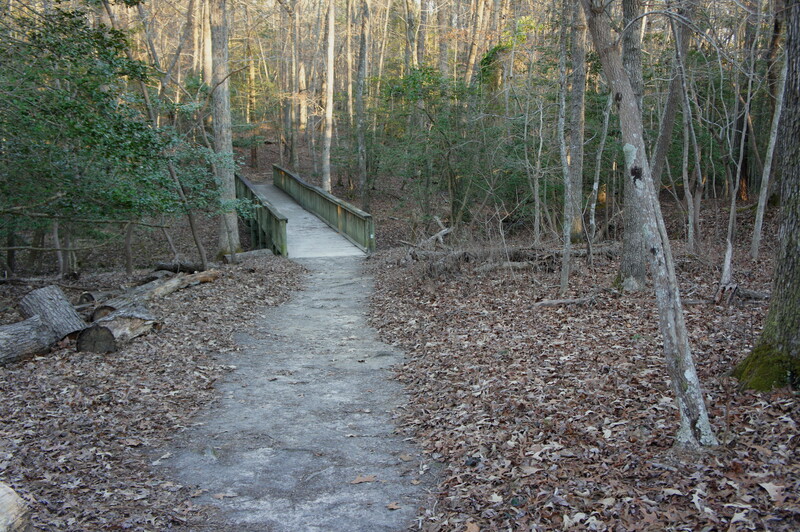 At 4/10 mile, the path crosses a minor ravine then intersects with wider Long Meadow Trail at about the half-mile mark. Take a right, then take a right again steps later as the Twin Forts path bears east to continue the loop. After their initial success, the Vermonters braced for a counterattack, though this too failed as the 15th North Carolina Infantry received an unauthorized order to retreat. The Union regiment, however, was set up to fail: with wet ammunition and no reinforcements, their position was unsustainable. 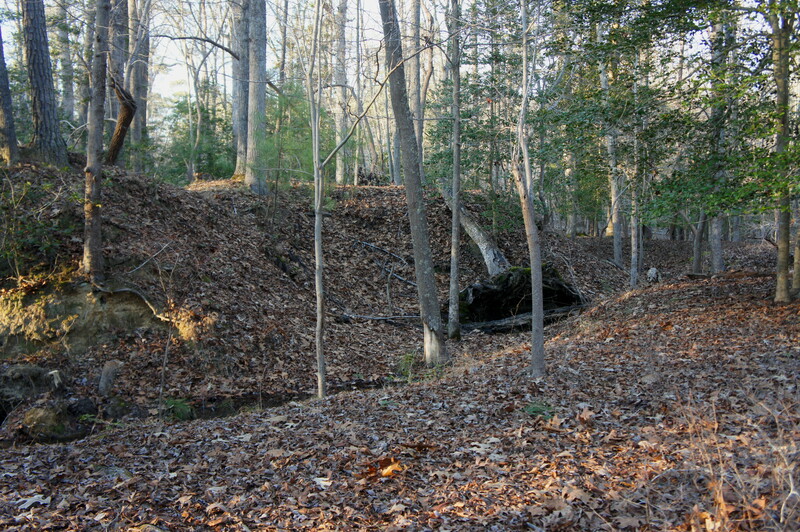 The trail from here explores the upper reaches of Confederate earthworks, where Brig. Gen. Howell Cobb planned his counterpunch. As Cobb’s North Carolinians regrouped, they again pressed the attack and forced the overwhelmed Vermonters to retreat back across the Warwick River. The rest of Brig. Gen. Lafayette McLaws’ division arrived thereafter, helping the Confederates to repel a second Union attack in the evening. Darkness fell, and the Federals called it quits. Historians see the Battle of Dam No. 1 as a lost opportunity for the Yankees, and it would take another 2-3 weeks for the numerically-superior Federal force to press through Magruder’s second line. 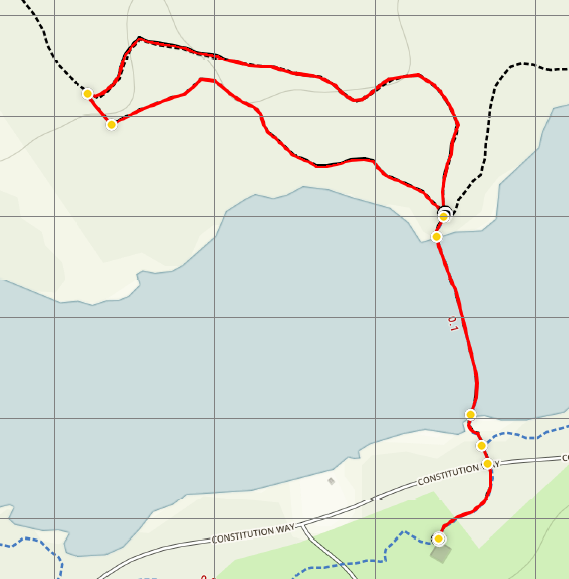 Completing the circuit, the Twin Forts Trail rounds a bend and returns to the reservoir at around 9/10 mile. Stay left at the fork and cross the boardwalk again, returning to Constitution Way. Cross the road and make your way uphill to the Discovery Center, where the hike began. Allot between 30 minutes and an hour for this easy, pleasant hike. This entry was posted in Civil War, Easy Hikes, Hampton Roads, Virginia and tagged Battle of Dam No. 1, Civil War, Dam No. 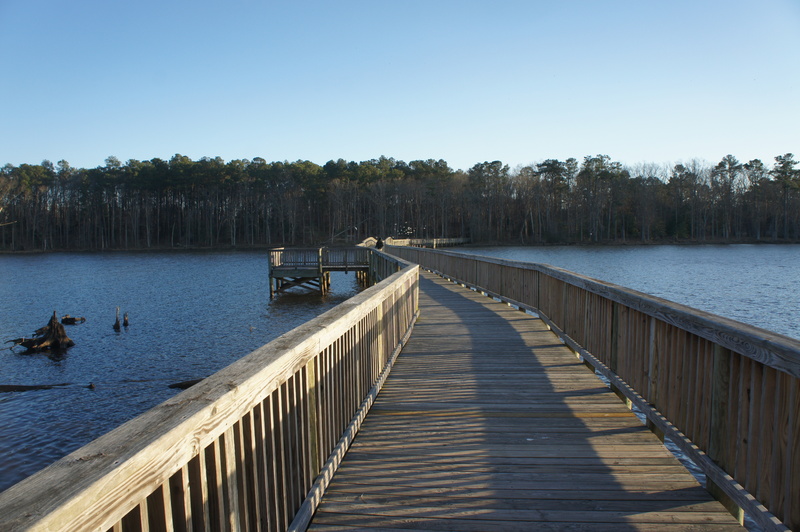 1, historic, Lee Hall Reservoir, loop hike, Newport News, Newport News Park, Peninsula Campaign, Virginia, Warwick River. Bookmark the permalink.